From 1738 and the Marquis Orry de Fulvy, through Napoleon and up to the present day Sevres Porcelain has always been among the finest in the World. Throughout its long history Sevres Porcelain has reinforced and advanced the French reputation for producing some of the worlds highest quality porcelain. It enjoyed French Royal preference and influence throughout the 19th century, even when various style changes were introduced. 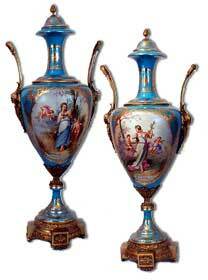 Napoleon was a fan of the Sevres Empire Style.